Tokai Forum - a subsidiary of TokaiRegistry.com :: View topic - ObG Reissue with 3 piece back? ObG Reissue with 3 piece back? Posted: Thu Nov 13, 2008 10:21 pm Post subject: ObG Reissue with 3 piece back? Did Orville make Reissues with 3 piece backs? 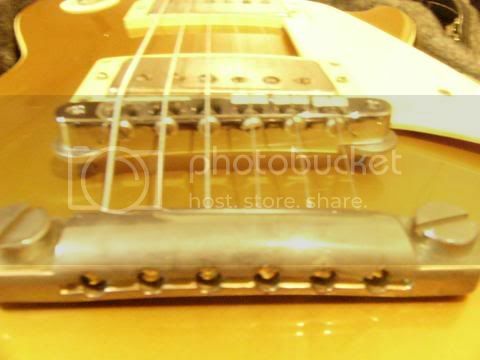 I found a goldtop with fretbinding G3 serial, patent applied for pickup so everything points to a Reissue. But im pretty sure it has a 3 piece back. G3 = 1993 so it could be a reissue. Posted: Sat Nov 15, 2008 12:40 pm Post subject: Re: ObG Reissue with 3 piece back? BUt on this one, honestly, it's very difficult to tell. Looks like 3 pieces but sometime, even with the guitar in hands you must check very carefully to see if it's the grain of the wood or 2 pieces of wooD. the trick about determining body joins is what I call annular ring run out/annular ring intersection. annular rings in lumber do not just disappear/intersect for no reason, they disappear/intersect because of joins. On the above OBG example, there is annular ring run out/annular ring intersection at the toggle switch cover level, which is very obvious. Also, there is another join, just across the top of the control route cover level, which is not quite as noticable as the other join but it's there. When it comes to annular rings in lumber, they tell a story, in fact they tell many stories. Here is my OBG LPR... G3xxxxxx. 3 piece for sure. Beautiful guitar otherwise. Very light. Nice one, very nice & thanks for the pics. 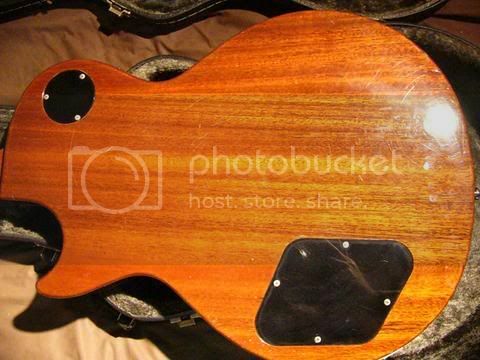 My favorite Les Paul is still my lowly Burny RLG-50, with its' 3 piece back. I couldn't agree more about the Burny's, MIJvintage... my two Burny Customs (SG and LP) are my #1a and 1b. I purchased this very guitar so if anyone is in interested in buying it off me please let me know. I wasn't put off by the 3 piece back but anyhow ObG in decent condition are so difficult to find these days that it makes me wonder whether there won't be any available, specially overseas (i'm living in Japan), in the near future. Posted: Sat Dec 13, 2008 3:18 pm Post subject: Re: ObG Reissue with 3 piece back?